MuSE is a 12-week museum career-development and training program for high school juniors and seniors. Participants explore museum careers and serve as advisors in the development of other teen programs at Newport Art Museum. 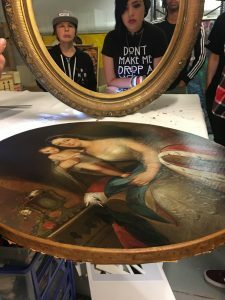 By becoming part of a network of peers, mentors, guest lecturers and museum professionals, teens are immersed in the Museum and come to understand the institution’s role as the premiere arts campus serving Newport County and the surrounding region. The approach of school-to-career mentorship promotes lifelong engagement with art and culture and develops and prepares participants to be the next generation of museum professionals, membership and audience. The students will work side-by-side with museum staff planning and executing public programs. MuSE teens will act as liaisons to peers in their communities thereby serving as a valuable resource for the Museum in reaching young audiences. To create a platform to explore museum careers, drive the development of teen programs, through immersion in the Newport Art Museum’s daily activities instill understanding of the institution’s role as the premiere “Arts Campus” serving Newport County and the surrounding region, and to foster lifelong engagement with art and culture while developing and preparing participants to be the next generation of museum professionals, membership and audience. MuSE will provide Rhode Island high school students opportunity for involvement at the Newport Art Museum, the leadership role in teen programming at the museum from concept to completion, and be a springboard for lifelong engagement in museums and arts institutions for MuSE cohorts through deep involvement in the institution as a case study for museum careers. Muse is Museum Studies Experience for high school students at Newport Art Museum.